Phenols to begin with, followed by a tarry note, tender cold smoke and malted barley. Slightly sweet with a delicate fruity touch of lemons and apricots. Hints of oak spice, ginger and cloves in the back. The high alcohol content is always present but not yet pungent. Oh yes, this is very bold on the palate! Initially, there is a delicate sweetness of vanilla, barley sugar and a hint of honey. Then the alcohol hits your taste buds with full power: very warming and intense with a spiciness of oak, caramelised ginger, white pepper and cloves. Once the warmth fades (which can take up to a few minutes), notes of apricots and salted toffee are coming through, all wrapped in discreet peat smoke and coal ash. The finish is long, warm and dry with subtle barley sugar, cloves, pepper and hints of ozone. A big splash of water tames the alcoholic bite significantly while more fresh sea air and phenols are coming through, followed by ozone and malted barley in the back. Sweet and prickling on the palate with apricots and a spicy note of pepper, nutmeg and cloves. The alcohol and the resulting warmth are very well tamed. Sweet vanilla with peat smoke and ozone towards the finish. The finish is a bit shorter and very dry with cloves, oak, peat smoke, ash and a creamy touch of vanilla. A real beast with over 65% abv, for which you should be prepared. 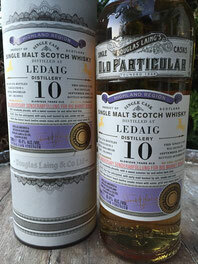 A typical Ledaig, which is not quite as phenolic, tarry and with coastal flavours. Surprising and very pleasant are the sweet and fruity notes, which appear in the nose and first also on the palate, before the alcohol strikes mercilessly. But not unpleasant! A really tasty dram, which - after the "shock" of the first sip - very pleases and is well drinkable neat. I thank Henning Mahler from Have-A-Taste for the complimentary sample!